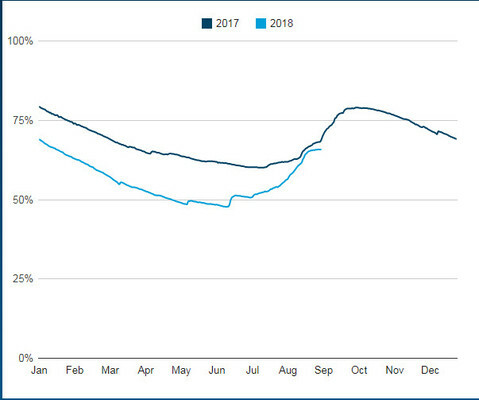 HIGHER: A Barwon Water graph showing storage levels rising to a similar level as at the same time in 2017. Barwon Water is confident Geelong’s supplies for spring and the summer will be safe and secure despite the region’s relatively dry winter. Infrastructure systems manager Will Buchanan said Geelong’s total water storage was sitting at “a good level despite a warmer-than-usual winter”. “Geelong’s water storages are currently at 65.8 per cent. This is 3.2 per cent lower than this time last year but still high enough to meet the projected water needs of the region,” Mr Buchanan said. Mr Buchanan said the Barwon system’s storages had risen more than 2000 million litres during the final weeks of August. “We carefully monitor our storage levels and quality to ensure a secure, reliable and high quality water supply at all times of the year,” he said. Storage figures take into account only surface water reserves, so Mr Buchanan was confident supply would meet demand despite Geelong’s increasing permanent and seasonal population. “We don’t expect we will need to draw on any additional sources of water this summer, even with an increase in tourist numbers,” Mr Buchanan said. “Spring is traditionally the most productive water harvesting period and, should we receive decent rainfall over the next month, we would expect a boost to storages ahead of summer. “Back-up options can be called upon if needed, such as the Melbourne to Geelong pipeline, connecting Geelong to the Melbourne water system, which is secured by the desalination plant. Barwon Water is the state’s largest regional water corporation with more than 280,000 customers spread over 8000 square kilometres. The authority has a long-term water planning strategy in place. “Barwon Water invested in the pipeline as part of our commitment to planning ahead and responding proactively to the global trends of climate change and population growth,” Mr Buchanan said.